We have a visitor in our house, it is a 3D printer and this kept me busy during the vacation. 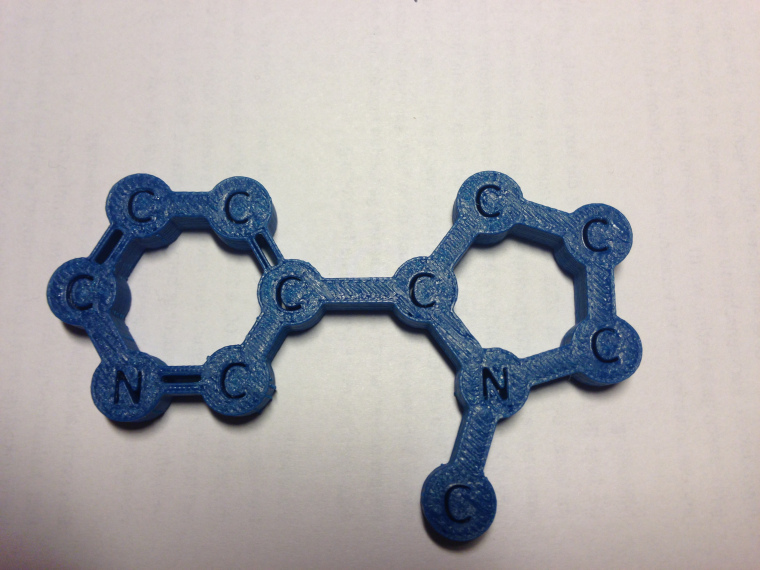 The last few days I designed a number of molecules and uploaded some of them to thingiverse so that you can replicate them. 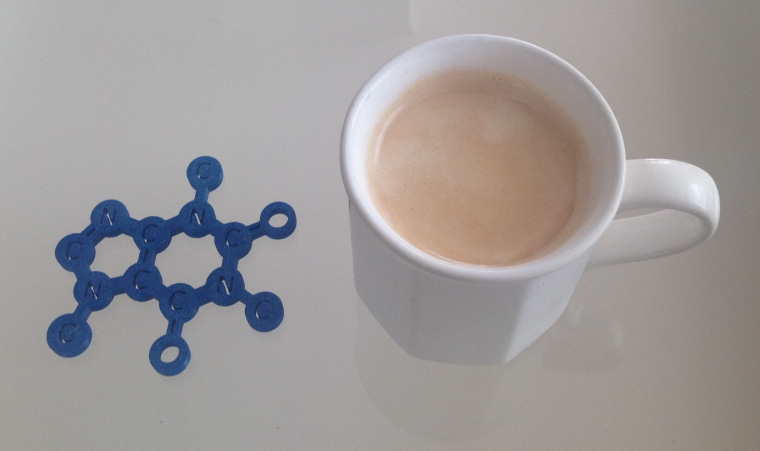 The caffeine molecule can also be used as a coffeemug placemat. Or maybe you can just want to show it as it is. 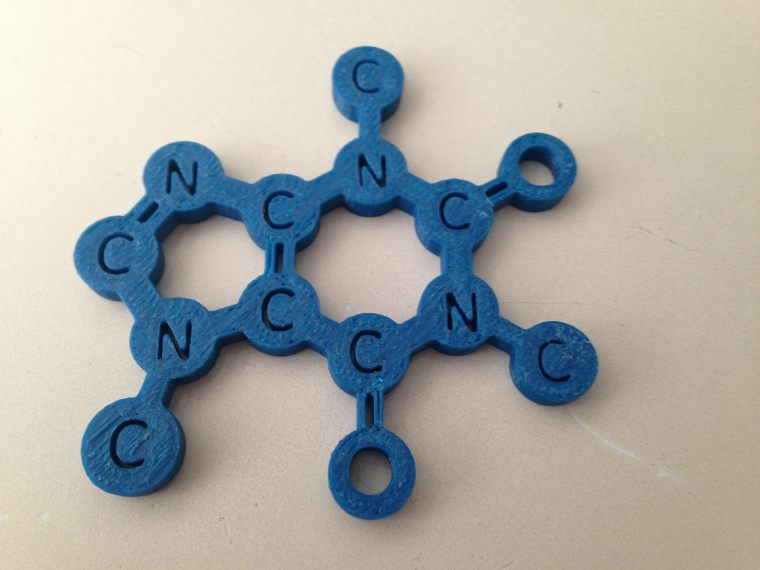 When you print the caffeine molecule in this way all atoms and the bonds can be identified. I omit the hydrogen because it adds complexity that we don’t want, happens a lot in molecule structure drawings. Interested in making one? Here is the STL file https://www.thingiverse.com/thing:618654 that you need to send to your 3D printer. Lets try another one, nicotine, which makes smoking is so addictive. I did not have a particular use in mind for this molecule, maybe you could use it as an ashtray but we don’t smoke in this house. The previous owners did and I had to basically strip all the walls and ceiling to get the odor or this molecule out of the house. If you don’t have a 3D printer and don’t consider to buy one then perhaps one of the 3D printing services like 3dhub can help you out. I’m not part of a 3D hub, but I found one within a few kilometers from here. 3D printing is gaining popularity and can also be found in some stores nowadays. The HEMA lets you print your own smartphone case, or even jewelry. But there are even more applications that you may not have thought of, like 3d printed food and, don’t be scared now, 3D printed organs. I love all of Yours projects. Can you to do serotonin and dopamine molecules in that style.? Ok, I will work on this.